The Assignments Editor is displayed when you select the Create Report or Open Report on the main application File menu. If you open a saved report, then the grid will automatically display all the assignments you previously made, and the file name will get displayed in the top left-hand corner of the dialogue. You can maximise the dialogue if you prefer to have a larger viewing area. This setting gets saved. As you select or click a row in the schedule, the Not Available list will update to remind you which brothers can't be assigned. There are several ways that you can populate the schedule. You are encouraged to read this whole topic to clearly understand what features you have available to you. Learn more about the Assignments Editor by looking through the rest of this help topic. Or, as an alternative, click on the item you are interested in on the screenshot above.You can directly jump down to any part of the help topic by clicking on the control that interests you on the screenshot above. Firstly, you will see a pre-filled in set of dates for your chosen date range. These dates are determined from the program options. So under normal circumstances you won't need to alter these dates. However there are some valid occasions when you might want to change a date (maybe you have the circuit overseer and thus the meeting has swapped to another day). So if you need to alter a date, just double click it. When you double click the date, it looks like the snapshot shown here. You can then click on each part of the date and use the small up/down arrows to alter the value (or you can manually type the new value). The date is displayed using your PC regional settings or can be customized. The status bar also displays the date for the selected row on the left. To fill in an assignment manually, click the small dropdown list allow to display a list of names and simply select one. Likewise you can change a name by doing the same thing. The names that are listed depend on three factors. Firstly, they are based on the names you added using the Publishers Database. 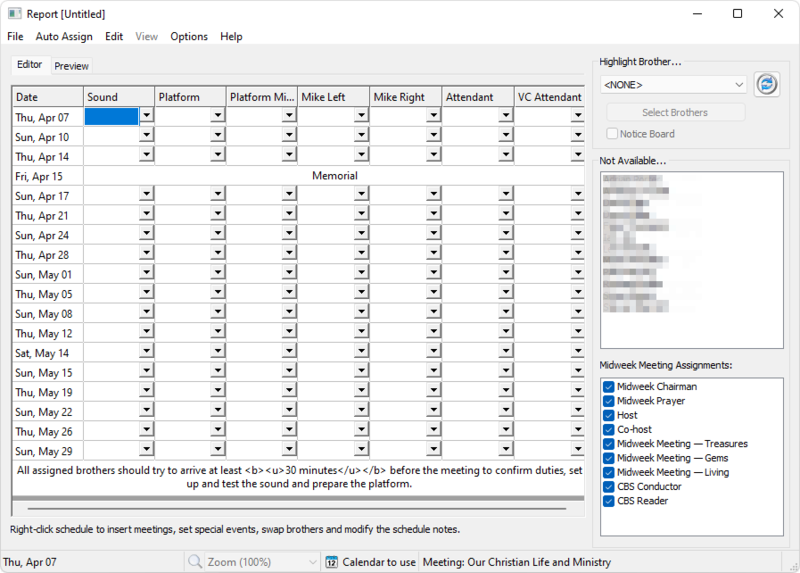 Secondly, it depends what meeting day it is, as only those available for the chosen meeting will be displayed. Lastly, a brother might have been specifically excluded from the meeting. You can also double-click the cell to go into edit mode and you can type in whatever text you like. This might be useful if you want to add a random brothers name (not on the dropdown list) or if you want to clear the cell contents. Click another cell, or press the Enter key to leave the edit mode. Press the Escape key to abort any changes made to the cell. Use this dropdown list to select a brother to highlight all his assignments. This is very useful if you want to print or export the report for a brother in particular, since he will clearly see his assignments. Someone might supply you with their own SRR file and the names they used may not match those that you have held in Meeting Schedule Assistant. Or, you may have assigned one or two individuals manually on the schedule (for whatever reason). In these situations you can click the Refresh symbol to update the drop-down list. Use this feature with caution since the operation can't be undone! You can repeat the process at any time, but you can't undo it. Having said that, the list will revert back to the default set of names the next time the editor is started. Select <NONE> to remove any highlighting from the schedule. Highlighted assignments are shown in cyan. Existing highlighted cells get removed (for example, conflicts of assignment). This affects how reports are printed and exported. You end up getting a report for each brother with his assignments highlighted. Note that for HTML, it will seem that the tables are one under the other, but when you print, you will actually get a page break in between each one. Choosing this setting works in exactly the same way, except that you can select which brothers you would like to include when printing or exporting. When this option is selected, the Select Brothers button becomes enabled. Press this button to alter the selected brothers. This selection is saved along with the rest of the programs settings. When you use either of these advanced modes for printing and exporting schedules that only the brothers who actually have assignments will be included. There is no point printing or exporting a schedule for a brother who has no assignments. This option is only enabled when using one of the advanced modes. Set this option if you want to include a schedule with no highlighting for the notice board. This option is available when the highlight has been set to All (Separate Pages) or Selected (Separate Pages). This option changes the way the reports are created. A small slip is created for each brother as opposed to a full schedule. Note that you can't directly print these duty slips. You must press Print Preview instead. Also, you can personalise how these slips look by pressing the Export Settings button. Press this button to close down the report editor and return to the main dialogue. If you made changes to the schedule and did not save it, then a pop-up dialogue will ask for confirmation before the dialogue is closed.